Possibly the only thing better than donuts is money. But that's only because dollars are just seeds that bloom into donuts at will. We'll have to get into the finer points of that argument later, though, because as Entenmann’s new Chief Donut Officer, you won't have to choose: You'll get $5,000 and a year’s supply of donuts to go with the job title. The classic donut and packaged baked good purveyor announced its search for a new CDO (sound fancy, right?) on Monday. To apply for this prestigious position, head to www.chiefdonutofficer.com before June 30. 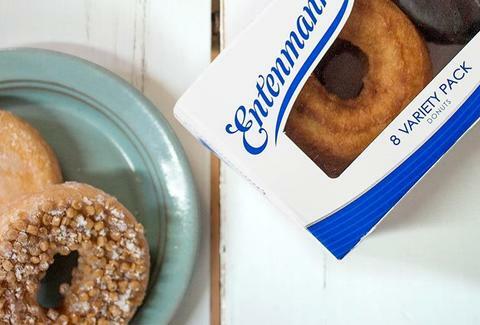 To prove you're the best candidate, you'll have to express your love for Entenmann’s donuts and answer questions like "How would you help spread the love of Entenmann’s Donuts if you become the honorary Chief Donut Officer?" Five finalists will be selected based on their passion, creativity, and originality. And you have all of those things, plus you like donuts. You're a shoo-in. Sometime after June 30, the five finalists will submit video testimonials making a case for why they're worthy of the Chief Donut Officer title. The public will watch those videos and decided on a favorite, which will be announced on August 7. That grand prize winner will get a bunch of Entenmann’s swag, plus the aforementioned $5,000 and year’s supply of donuts. But even if you don't become Chief Donut Officer, the four runner-ups still get $1,000 and a year of free donuts. Which is pretty great, too. This is all in honor of National Donut Day on June 1. If you win and become CDO, you will presumably be the food holiday's equivalent of Santa Claus come next year. But that's not in the official terms and conditions.